The most essential skill on the high bar is the swing. Almost every skill on this apparatus consists of a front or back swing. This is why it’s critical for the gymnast’s future career that they can correctly execute this element. The skill starts at the highest point in the backswing. Their body should be in a hollow position with their head neutral. At the bottom of the swing, the gymnast should be slightly arched in order to whip and return to the hollow position in the front. There are a few modifications for the tap swing. The first is for flyaway. In this case, the gymnast should rap before reaching suspension. For a giant, the gymnast will need to accelerate the speed of their swing. This can be done by tapping slightly after the suspension. Regardless of the modification, after the tap, the gymnast’s body should continue in a hollow position until the top of the front swing. After that follows the back swing. Until the bottom of the back swing the body should be exactly tight. After the suspension, the body should begin to hollow to a slight pike and the athlete shifts over their wrists. This helps them remain on the bar. The back swing finishes at the top of the move in a hollow position. In the highest point of the backswing, the gymnast transfers their body onto the holding hand. They should squeeze their buttocks, lower their free hand next to their side, and maintain a hollow position. 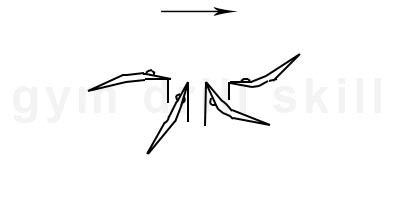 For this drill, the holding hand should be in a strap, while the free hand should be holding onto the bar with a grip. The progression should start with lower swings and it should gradually increase in amplitude. 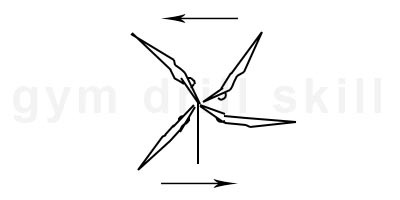 At the last stage of the drill, the gymnast should pass over the upper vertical. A spotter is required. During the second part of the giant, a coach is needed to correct the direction of the giant incase the gymnast goes crooked, and to spot for shifting of the wrist.